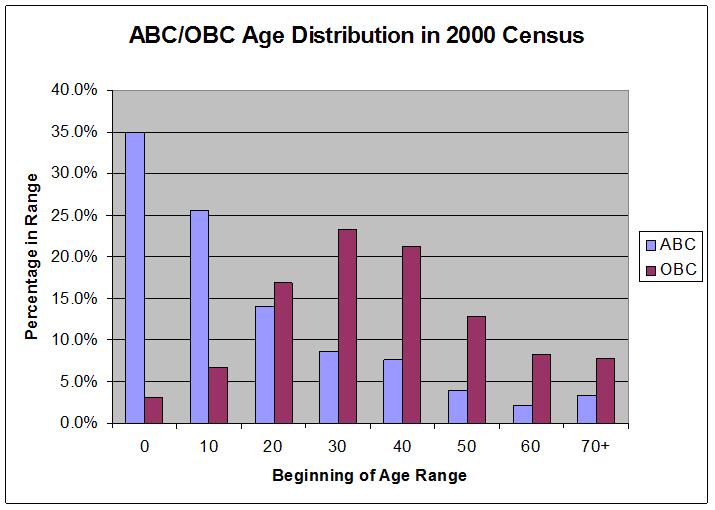 I spent a little more time with the U.S. Census Data Ferret, and came up with an interesting comparison of the age distribution of ABCs and OBCs in 2000. I think that this helps to explain a particularly challenging leadership problem in U.S. Chinese churches in moving to the parallel stage and beyond. These numbers pose a challenge to raising up mature leadership for the English Ministry (EM). In order to enter the parallel stage of ministry structure, the EM must find its own leaders for each ministry area. But usually those leaders are quite young. 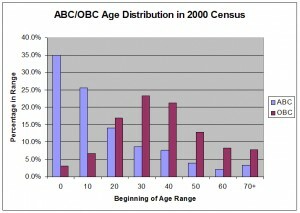 This is not surprising, since in 2000 only 16% of ABCs were over 40. In a culture that respects age and values experience this can pose a problem. It is difficult for the Chinese Ministry (CM) leaders to respect their EM counterparts as equals when there is a significant difference in age. This problem becomes particularly acute when it comes to finding EM leaders to serve on the church board, which is an essential step in helping the EM to move toward maturity. In principle, my church is committed to having board members from both congregations and has not set a minimum age. Yet culturally it is very difficult for a 27 year old to serve as an equal with board members who are in their 50s and 60s. The temptation is to look to the few older people in the EM and put them into leadership positions whether they are qualified or not. But spiritual maturity is a non-negotiable requirement that does not automatically come with age. 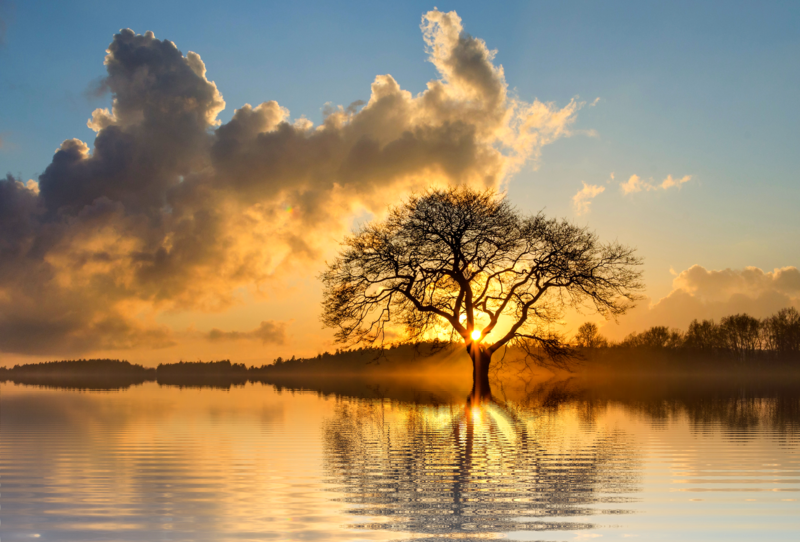 Furthermore, spiritual gifting cannot be ignored. Some of the older people will not have the gifts necessary to be an effective leader, and it is a mistake to make them leaders simply due to seniority. It also won’t work to tell the EM that they should try to attract older people, because ABCs in their 50s and 60s are very scarce. In “first wave” and “China town” churches the situation is very different, and there are different challenges. But most of the Chinese churches in the U.S. are “second wave” churches which face this sort of problem. The fact that many of our key EM leaders will be relatively young is a given. Try very hard to work together despite the usual age differences. For younger EM leaders this means being careful to show respect to older leaders, even when you need to express disagreement. For older CM leaders this means trying to treat younger EM leaders as equals and allowing them to lead at a relatively young age. Allow the English Ministry to have enough independence to run most of their ministries on their own. If most of the day to day ministry decisions are made by separate EM and CM ministry teams, it gives the younger EM leaders a chance to grow in their leadership without feeling that they are “under” CM leaders. But it will still be necessary to make a way for younger EM leaders to serve on the board. Have you encountered this age difference in your church? How has it impacted your top leadership? How have you dealt with this challenge? For those who are interested or who are doing their own research, these data are based on the 5% sample microdata file from the 2000 Census, selected for “Chinese alone” using the Data Ferret program. The charts were produced by saving the results as a .csv file and analyzing it using MS Excel. Do ordinary people read boring magazines? Would you be able to do this same study for the 2010 census data? I wonder how much it has changed. I tried to do it myself, but I can’t seem to isolate the right variables :p.
I wanted to do the same study on the 2010 census, but when I looked into it I could not find the detailed data on race that was available in the 2000 census. The 2010 census did not ask as many detailed questions, so the data I need is not there. I guess we just need to extrapolate from the 2000 census data. If anyone knows how to get recent, detailed information of this kind, please let me know.